These cardboard critters start as petite puzzles. Snap them together to create a narwhal, sloth, or llama. Calling all animal lovers: Building a zoo is easier than you think. These critters are actually petite puzzles that can help improve kids' concentration and precision as they grow confidence in their own creativity. 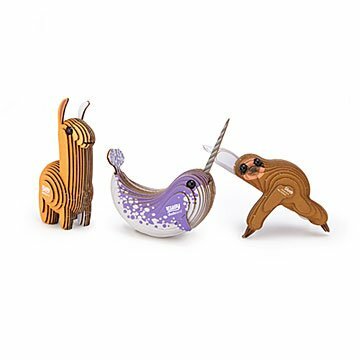 Easy to assemble and fun to build, each animal is made of eco-friendly, recycled cardboard with safe, rice-based inks and organic, non-toxic glue. Numbered pieces come together to make a contoured creature (narwhal, sloth, or llama) in about 20 minutes. Designed in New Zealand. Made in China. Bought this for an 8 year old and she had a blast putting it together and was able to do it herself! So simple and fun. The llama is adorable. My sister is in love with llamas, she was delighted to receive this for Christmas and now wants every single mini creature they have. It's hard to find narwhal's! Got as a gift for my daughter who loves narwhal's. My son enjoyed this gift, especially figuring out how to put it together and proudly displaying it on his shelf. Loved these little 3D puzzles! I will buy every new puzzle that becomes available. Just a great puzzle toy. My daughter assembles them (she's an engineer) and the displays them on her desk at work. Lots of comments from passersby.